Have you entered the Giveaway yet for two coupons for FREE Bertolli Meal soups? I know strawberry season is pretty much over, but I couldn't resist sharing this amazing jam recipe. It takes just one package of strawberries, so it's definitely worth the extra splurge in the fall. At the farmer's market, I picked up a basket of plums for $1. D claimed not to like plum jam, so I decided to try a plum strawberry in order to entice him to just TRY the jam. I modified a recipe on the Sure Jell pectin to create this deliciousness. Chop up about 3 lbs of plums. Get rid of the pits and do not peel . The peel is what creates this GORGEOUS color. Hull and halve 1 lb of strawberries. Place fruit in a large saucepot and add 1/2 C water. Bring to boil. Reduce heat and cover, letting it simmer for 5 minutes. Stir in 1 box of pectin. Bring to a full boil on high heat, stirring constanstly. This means when you stir it, it's still boiling. This is really important to making sure it sets properly. Then, stir in 8 C of sugar. Try not to think about it. I've done a sugar free version of this using low sugar pectin if the sugar amount freaks you out, too much. Bring it back to a full rolling boil and boil exactly 1 minute, stirring constantly. I bring a high barstool over and set a timer once it hits the boil point. 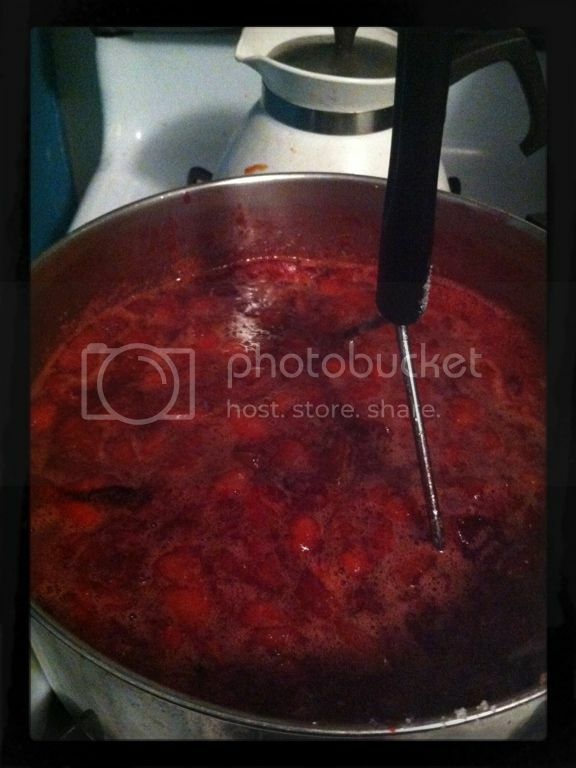 Ladle your jam into prepared jars, leaving 1/4 inch from the top. Wipe jar rims and threads. Cover with two piece lids and screw the band on tightly. Place jar into a hot water bath. Water needs to cover the lids by 1-2 inches. Cover and bring to gentle boil. Process for 10 minutes. Remove and place on a cloth on your counter and wait to hear the PING that the lids have sealed. It should make about 6 half pint jars of jam. I don't know why it photographed so purple! It is a lovely red color. Very vibrant and fresh. 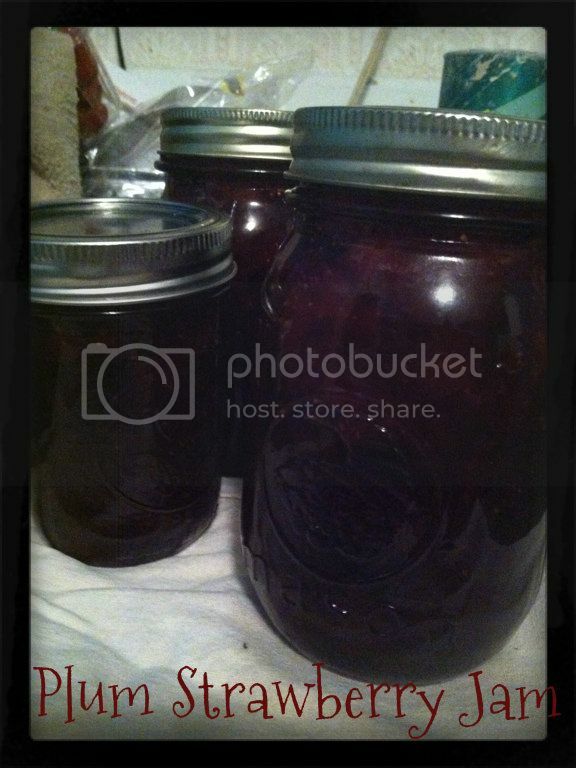 And the taste...well...people have asked to buy jars :) It's THAT good. I just had the BEST plum jam of my life. A friend of mine gifted me a jar. I had never tried it and I just loved it. I's think that the plum-strawberry combo would be delicious. They are two of my favorite fruits. Thanks for sharing! I love PLUM ANYthing...and with strawberries...ummmm, perfection. This sounds delicious! Yum!!! Thanks for sharing! That looks great! I've never made jam before, thanks for the step by step! This looks super delicious! I love Plum Jam but have never added Strawberry. I think I'll have to try it this year for sure. I've always used the lower sugar pectin for all my jam's and we have never missed the extra sugar. Thanks for linking up to Creative Thursday. Can't wait to see what you share next week. My sister makes this combination and it really is amazing! Thanks so much for sharing at Mom On Timeout!